Drugs can interact with each other in different ways. Cannabis is no different. More people have access to medical, nutritional, and adult-use cannabis than ever before. Yet, many consumers feel uncomfortable broaching the subject with medical professionals. Further, many medical professionals are still woefully undereducated when it comes to appropriately using the herbal supplement along with medications. This means that many consumers may be unaware that the herb might be negatively interacting with their pharmaceutical medications. 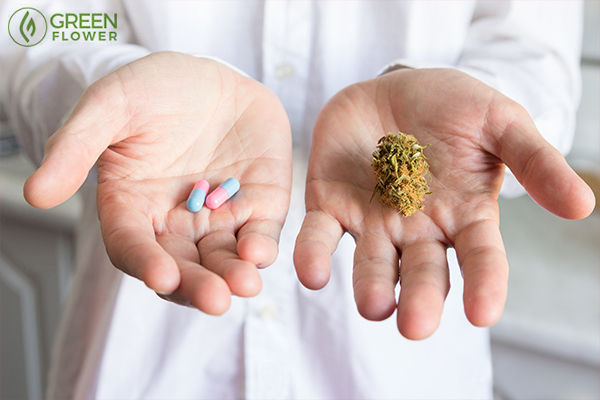 Cannabis can have both positive and negative effects on prescription drugs. Does cannabis have negative interactions with pharmaceuticals? Your physician needs to know what you're taking, and what you're not taking. Unlike many prescription drugs, cannabis is non-toxic and has a high margin of safety when compared to other commonly consumed substances like alcohol, tobacco, and caffeine. In fact, according to the U.S. Drug Enforcement Administration (DEA) and the Centers for Disease Control (CDC), there have been zero reported deaths from cannabis overdose. Yet, just because cannabis is safe on its own does not mean that it is good to mix with all medications. Cannabis is a powerful herb that can have profound effects on the body. This includes the ability to either counteract or enhance the effects of certain pharmaceutical medications. If you are considering adding in cannabis to any sort of treatment routine, it’s wise to ask your doctor about possible drug interactions. While more research is needed, there are a few types of prescription drugs that may have increased side effects when combined with cannabis. Beta blockers are drugs used to lower blood pressure by blocking the effects of adrenaline, the hormone responsible for the fight or flight response. Taking beta blockers reduces your heart rate and prevents cardiac stress. Cannabis, however, may have contrasting or amplifying effects on beta blockers. The herb can cause blood pressure to fluctuate while simultaneously causing the heart to beat faster in some people. In novice consumers, blood pressure may increase slightly. Regular consumers can become tolerant to these effects and may even experience reduced blood pressure and heart rate. However, the potential increase in heart rate is thought to increase your risk of having a heart attack. Especially in those with a predisposition for heart problems or who have a pre-existing condition. The complex effects that both of these treatments have on heart rate may make combining cannabis and blood pressure medication might be a bad idea. Some of the side effects to look out for include dizziness, feeling faint, irregular heartbeat, fatigue, and nausea. If you notice peculiar or prolonged heart complications, contact a medical professional. Combining cannabis with tranquilizers like sleeping pills or anxiety medications like Ativan or Xanax may cause some consumers to feel overly sedated to the point that it becomes unpleasant. Some symptoms to watch for include slow and impaired speech, slowed movement, dizziness, fatigue, and lethargy. When used in combination with a sedative medication, cannabis should be monitored closely. In extreme cases, SS can be life-threatening. The condition can cause agitation, anxiety, headache, confusion, mania, shivering, nausea, sweating, diarrhea, tremors, and more. There is little high-quality evidence that cannabis contributes to SS. However since the herb has an effect on serotonin, it is important to be mindful when mixing the substances. Chances are if you're having a bad experience, something is awry. Some cannabis compounds may also change how the body breaks down antidepressants, which means that the herb can enhance their effect. This potentially puts patients at a greater risk of negative serotonin side effects when taking cannabis and antidepressant interactions into account. When combining cannabis with opioid pain medications, you may need to lower your dose of the prescription drug. Cannabis can interact with the opioid system in the body, which contributes to the herb's pain-relieving effects. 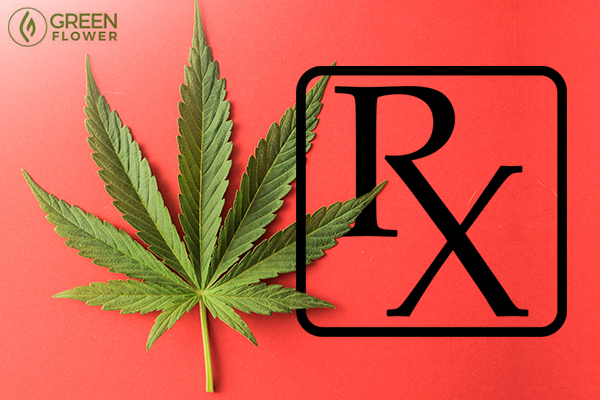 While recent medical literature suggests that combining cannabis with opioid treatments may improve pain control and reduce the dosage of opioid painkillers needed for therapeutic effect, combining the two types of medications is something that should be monitored. Those taking drugs that include buprenorphine, a particular type of opioid pain medication, may need to be especially careful. Both substances can have depressant effects on the central nervous system and may hinder the respiratory system in extreme cases. The interactions with cannabis and other opiates like morphine are currently thought to be less severe. Does CBD have negative interactions with pharmaceuticals? CBD in particular can change how your body metabolizes other drugs. Even cannabidiol (CBD), which is now sold online and available in several different countries, may interact with a large number pharmaceuticals. CBD is one of at least 113 chemical compounds in the cannabis plant called cannabinoids. Unlike tetrahydrocannabinol (THC), the primary psychoactive in the herb, CBD does not cause a psychotropic “high”. CBD can have both positive and negative effects when combined with prescription drugs. Research suggests that CBD blocks enzymes in the liver from properly breaking down and clearing out pharmaceuticals. To be specific, it blocks a family of enzymes called Cytochrome P450. These enzymes are the helpers responsible for detoxing 70 to 80 percent of pharmaceutical drugs from the body. CBD, however, takes over the enzymes and prevents them from undergoing liver metabolism. This is both a blessing and a curse. The good news is that this potentially allows patients to take lower doses of their prescriptions. The bad news is that this may increase the risk of toxic buildup of pharmaceuticals in the body. In a 2015 study tested the possible interactions between the anti-anxiety and anticonvulsant drugs, clobazam and norclobazam, in 13 patients. Researchers found that CBD did increase levels of clobazam and norcolobazam in the blood. The increase of clobazam caused side effects in 10 of the 13 patients. These side effects were reduced after researchers decreased the dose of the drug. Even with the decrease, however, CBD was still effective in preventing seizures. Well, at least so long as the prescription dosage is reduced. Does cannabis have positive interactions with pharmaceuticals? 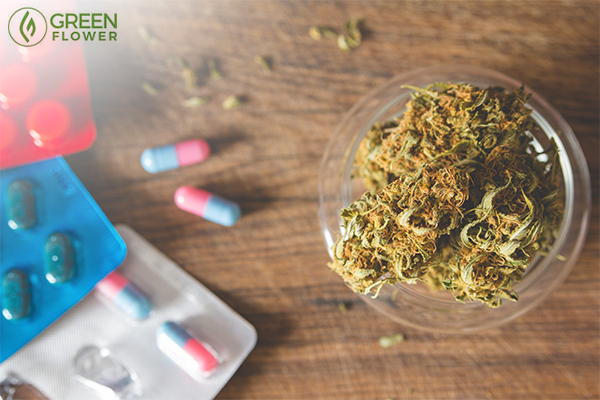 One of the reasons that cannabis is such a valuable tool in medicine is that the herb may allow patients to reduce their dosages of pharmaceutical drugs with significant side effects. While more research is needed, scientists have already discovered that cannabis compounds, when administered correctly, seem to enhance the effects of chemotherapy in animal models. Yet, mixing cannabis with pharmaceutical drugs is tricky business. Every patient will react differently depending on what types of chemical cocktails exist in their bodies at a given period of time. It’s important to listen closely to your body and communicate clearly with medical professionals about any new side effects or concerns when mixing the herbal medicine with pharmaceuticals. Always consult a doctor when making changes to your treatment plan or self-treating. What's the best cannabis dose for you? Are you personally concerned about pharmaceutical interactions with cannabis?